New York, USA -- Smiles were all around when Christie's recently sold a Japanese Buddha statue for $14.3 million, a price nearly 10 times the original estimate and a new world record for Japanese art sold at auction. The buyer was Shinnyo-en Temple, located in the suburbs of Tokyo. According to reports, the Buddhist temple's primary motivation was to keep the statue out of foreign hands. Said one auction insider of the selling price, "Buddha himself [would] have been surprised by this." 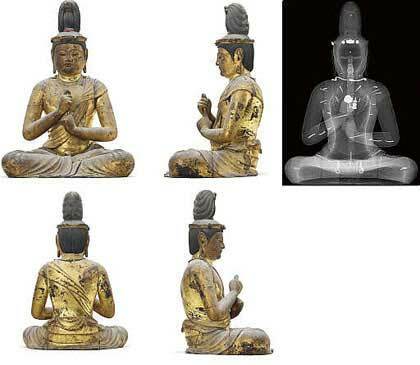 The statue, created in the 12th century and attributed to the Japanese sculptor Unkei, is a recent discovery, and scholars are only now beginning to trace its long history. During the 19th century, it is thought to have been owned by another Buddhist temple, but it mysteriously disappeared when the Japanese government enforced a widespread anti-Buddhist movement in a bid to unite Japan under its native religion, Shinto. The full story is incomplete, but it is believed the Buddha statue eventually found its way to a Japanese antique shop where a buyer picked it up for an undisclosed sum. Suspecting that it was hollow inside because of its unusually light weight, the astute buyer had the piece X-rayed by the Tokyo National Museum. In the belly of the Buddha, three ceremonial objects were discovered. They had been sealed inside the torso for over 800 years. Unkei was one of the great carvers of the early Kamakura period. Made of cyprus wood, the Buddha sits in a lotus position, with hair pulled up into a tight chignon, and wears royal dress and jewelry. The deity forms a distinctive hand gesture known as the "knowledge fist," one of many Buddhist ritual poses or "mudras." Buddhas carved during the early Kamakura period are considered among the finest Buddhist art in existence. Like many countries, Japan is fiercely protective of its artistic assets and has designated 12 works made or believed to have been made by Unkei as national treasures. The Christie's piece was not on the list and therefore eligible for exportation. Before the auction, there was reportedly a petition campaign in Japan to keep the piece at home out of fear that it would lead to an outflow of other national treasures. The campaign was apparently unsuccessful, but there was enough press on the subject to stir supporters into raising money to bid at Christie's. Had the Buddhist temple not stepped up to buy the piece, it would have gone to the under-bidder, an American collector. The record price "is a testament to the extreme importance and beauty of this supreme Buddha, and elevates Japanese art to a new record level," said Katsura Yamaguchi, Christie's director of Japanese and Korean Art. It is very unusual for a piece of this importance to suddenly resurface on the market. The previous record for a Japanese work of art was $1.76 million for a Rakuchu Rakugai screen, sold at Christie's in 1990. Over the past few years, sales of Asian art in New York have led to nice returns for the auction houses, with Sotheby's and Christie's selling $129.4 million worth of Asian art last year, up from $97.9 million in 2006. To put this $14 million price into perspective, Sotheby's recently sold a tiny, ancient Mesopotamian sculpture for $57 million, setting a record for any sculpture or antiquity at auction.